When Charles XII ascended the Swedish throne in 1697, his country was a European superpower, with a considerable empire round the Baltic. His army was not large as his resources of manpower were not considerable, but it was professional and aggressive, and widely considered to have the best soldiers in Europe, fired by a religious enthusiasm that made them brave to the point of being foolhardy. This set includes both musketeers and grenadiers, and though we prefer to keep troop types separate it does at least ensure all the major types of Swedish infantry are present. The musketeers make up over a third of the figures, and are almost all concerned with firing their weapon. There are no advancing or charging poses at all, which is a real loss as the favoured Swedish tactic was to fire a volley and then charge the enemy. The uniform is pretty well observed, with the tricorn and knee-length coat plus the broad shoulder strap holding the cartridge bag. Some have their skirts turned back and others have not, a mix that is reasonable for the time. The cuffs are very large, a feature of most European armies of the day, but the Swedes tended to have noticeably smaller cuffs than these figures. However they all wear the overstockings, which is accurate. A similar number of men are grenadiers, easily recognised by their tall mitre hats. This is probably the first plastic set of grenadiers where some of them actually have grenades, which is quite correct, though even then these were slowly disappearing from the battlefield. As well as the grenade throwers, there are men firing and some men advancing - a reasonable selection. The grenade throwers are nicely done, with good active poses. The same comments on accuracy apply to these troops as to the musketeers, though they do have all the trademark grenadier features. There are a number of troops (musketeers) which wear a soft round cap. This was called a karpus, and was very popular, becoming almost universal in some units, so it is good to see it included here. The remainder of the set is made up of officers and speciality troops. The officers are some of the most active poses, with partisan and sword in hand. The second figure on the last full row above looks very much like the young King Charles himself (he was only 27 at Poltava) as it closely matches portraits of him. The minister is a nice touch, emphasising the importance of the Church in these men's lives and endeavours. One surprising omission is pikemen. By 1700 the pike was redundant in most European armies, but the Swedes persisted with it and initially armed a third of their recruits with it. However it seems to have been phased out quickly during our period, and this set suggests a later period date by the fact that many men have the new socket bayonet on their muskets. Overall the figures are something of a contradiction. The general level of sculpting is fair, though these could not be described as elegant creations by any means. However there are many pleasing little details which have been very well crafted. There is no flash at all, but as usual the figures are attached to the sprue with very fat connections that practically require sawing. Another Strelets feature is the bases, which are very thin and tend to bend on the sprue. This is no worse than in previous sets, but does not do anything for the look, or the stability, of the models. The man biting his cartridge would be very unlikely to have let his musket rest on the ground like that, and the man with the flute or fife is holding it on his left, an unusual arrangement for which there is some evidence, but whether this was the norm is unknown. However this is a set with plenty of interest, and very few blemishes, and it has the advantage of being almost equally good for troops of most other European nationalities of the time given a suitable paint job. Note The final figure is of a soldier from the Streltsi of 17th century Russia. Though he is unrelated to the subject of this set (right period, but he certainly is not Swedish! 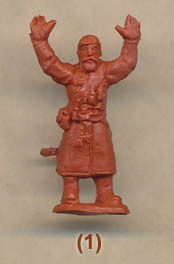 ), he is one of a series of 'bonus' figures which when combined will create a set of this unit for the Great Northern War. See Streltsi Bonus Figures feature for details.